We are so happy a Friend of Sierra Club encouraged you to support our work to protect the environment. Thank you for your gift in support of Sierra Club Canada Foundation. We hope you love Dizolve Laundry Eco-strips as much as we do! 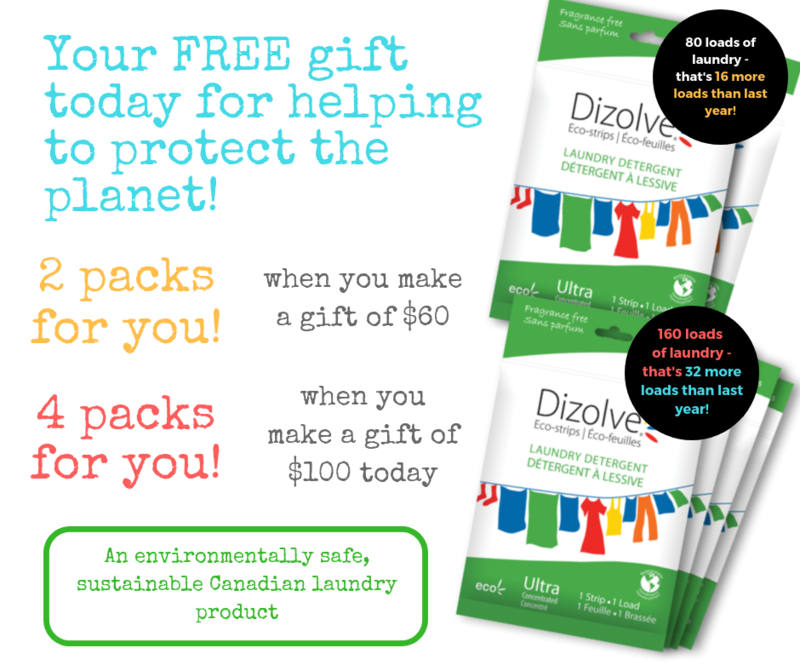 We'll send you 2 packs of Dizolve Laundry Strips when you donate $60! That's 16 more loads than last year's offer. We'll send you 4 packs when you donate $100! That's 32 more loads than last year! And when you make a special donation of $250+, we'll send you our comfy, cozy SIerra Club 1/4 Zip, available in two styles - traditionally women's style, or traditionally men's style - you choose! * Please indicate in the comments box (near bottom of this page) your style preference (Women's or Men's) and your size preference. Please refer to the sizing chart. Questions? Call us toll-free at 1-888-810-4204.